Last but not Least, TSTR DT Application 4! I went all out on this one. Shabby but bold! I started with a rather painstaking process of learning how to use foil. My first three attempts failed miserably despite following directions from several different prominent crafter’s blogs! Grrr… But I finally got results I could use even if I didn’t love it. I applied Versamark through a stencil and clear embossed it. Then I added foil and ran my paper through my laminator. It melts the embossing powder so the foil can stick. Unfortunately, it also flattened the melted embossing powder causing it to spread out. So my pattern is a bit more messy than I had hoped for but hopefully that just enhances the shabby chic-ness. I made the small white flowers, I realized that I hadn’t use the baby’s breath as inspiration at all so I made the closest flowers I could! I think they softened an otherwise quite bold card. I used the yarrow die set from Susan’s Garden. Sizzix used to manufacture them but now I believe you can get them from Elizabeth Crafts. I used the Paper Players sketch 225. and of course The Shabby Tear Room DT call. Next postGuess What? I’m a Shabby Girl! Good for you for trying something new! I probably would have headed for the hills if I had to try using foil! Lovely creation…the floral is beautiful and the background is really quite pretty! I'll bet it is even prettier in real life! So happy that you shared this with us this week at the Players! So pretty! Your background really does set off your bouquet of flowers beautifully. That butterfly is beautiful! 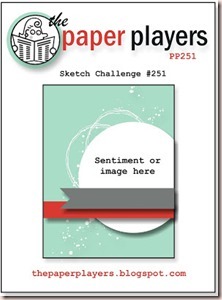 Thank you for playing along with the Paper Players! Very pretty card! Love the background. Thanks for playing along Simon Says Stamp Wednesday Challenge -Anything Goes! Wow, Rebecca this is amazing! Your background is perfect and the bouquet of flowers is so beautiful. This totally belongs in a frame. Thanks for sharing your work with us this week at The Paper Players! I think that your background turned out beautifully! 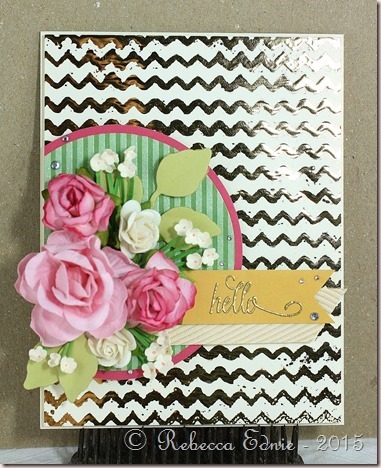 Your card is just stunning, love the metallic accents and the beautiful flowers. Thanks for joining us at The Paper Players, hope to see you again soon!